What to expect - Angel Holidays. :: Laos,Bangkok and Cambodia ::. Bangkok is modern by Asian standards yet with side streets, alleyways and markets that follow older traditions; it is alive with energy and people. We’ll give you the know-how to explore as the locals do; with an exciting mix of public canal boats, tuk tuks, taxis or public river boats; there’s a metro network too. It’s an exhilarating city with colourful nightlife. Thailand, as in all the regions we visit, has wonderfully welcoming and friendly people; as well as superb and interesting cuisine. 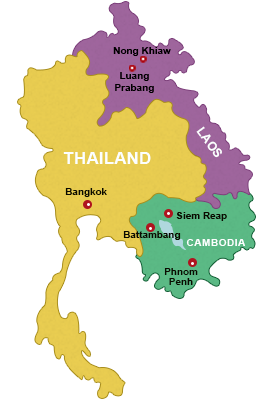 Laos and Cambodia (together with the more modernised Vietnam) form what is classically known as Indochina. Cambodia and Laos have French influences from colonisation. Laos is much slower paced and is charming and beautiful. In Laung Prabang you’ll be able to walk to most places, enjoy wonderful restaurants based on the rivers’ edge and magical Mekong sunsets. Our stay in the rural hamlet of Nong Khiew will show you a different side of Laos; that less visitors see. Our classic boat trip in this region heads north in the direction of the border with China where you’ll see simple villages and epic, less explored, scenery. Cambodia (formerly known as Kampuchea), has an ancient and fascinating Khmer history and more infamous past through the Khmer Rouge – particularly visible in Phnom Penh. Like Laos, it has rich jungle and some of its best locations are only accessible by river which we’ll explore. By Western standards the whole region is safe with very welcoming, with courteous and friendly people. With our journey lying firmly in the tropics, temperatures will be warm (sometimes hot) and pleasant. We have chosen dates for this holiday at the best time in the season. There is a small chance it can be cooler one evening in Nong Khiew in Laos, so bring a light pullover or fleece just in case. Food in the region is delicious and can be bought at every budget. Street food in Thailand for example, such as stir fries, can start as little as £1. You can also eat in more upscale restaurants for between £6-20. In Luang Prabang, due to its French influence you can enjoy fine wines and some excellent French restaurants. There are some traditional (and fun) restaurants too where you can BBQs fresh food at your own table. It’s wonderful and a good social occasion. Cambodia caters for all tastes from modern Western food to Khmer cuisine. Choosing where to eat each evening, in some magical settings, is a real pleasure and much better than being committed to a hotel restaurant. We can advise where. All accommodation is ensuite and on Bed & Breakfast basis with some evening meals for our welcome and farewell dinners. Your hotel in Bangkok is simple tourist class and well placed. In Laos it will be a traditional hotel or guest house (sometimes we’ll use more than one guest house/hotel) . In Nong Khiew it will be traditional simple with en suite rooms and exotically placed. Siem Reap, Battambang and Phnom Penh will be comfortable tourist class hotels with character, some hotels may have pools. Our groups come from all walks of life and all ages; from people in the twenties/thirties to retirees. We foster a friendly social atmosphere within the group, as well as giving you the space to explore on your own if you prefer. All activities within the itinerary are included (at no extra cost unless specified) and you can choose to participate or have a day off and relax – knowing you have the support of our staff and the group. This enables you to get the most of your holiday at a pace you choose. We always have a lot of fun too. You will be well looked after on this tour. You will have a dedicated tour leader and support staff along the journey. We employ local staff and guides at various sections along the journey to enhance your experience.